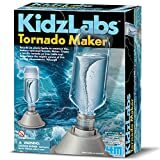 With this cool new KidzLab Tornado Maker Science Kit kids can safely learn about tornadoes without being in a real one and have a blast doing it. 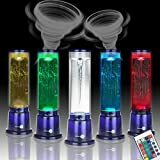 Once assembled, this fun weather science kit lets children screw on a water-filled recycled plastic bottle and then, with a flip of a switch, watch in awe as a twister forms inside the bottle. Yeah, I guess it would be more of a waterspout, but either way, it's a miniature version of nature's dark side captured right on your tabletop. Check out this video to see a kid show you how it works.